This layout shows the growth of my belly over the last 10 weeks. Most people think scrapbooking is expensive. Well your right. But it doesn't have to be. There are a few tricks that I use to keep costs low. For example, this whole page probably cost like $2. I thought the tittle 'Big Bigger Biggest' was appropriate and tried to keep it through the page, by making the title in growing size and each photo a bit bigger the the last. Cheap tip #1 print, trace and cut lettering yourself. Its a bit time consuming but often looks better then buying them, I doubt I could have got the words in different sizes like that from any store. There are ample fonts, sizes and colours to make exactly what you want. Cheap tip #2. 6*6 or 8*8 paper pads. These are just shrunk versions the 12*12 papers and are usually a lot cheaper. 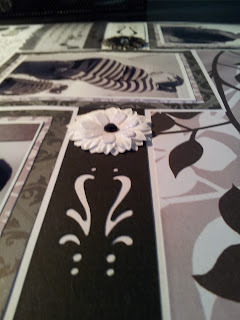 Using a white backing (or any other colour) stick the small papers on to it and create you background that way. 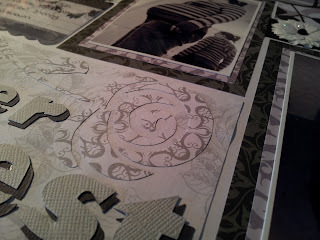 You can then place photos or embellishments over the joins to hide them, or embrace them by leaving gaps and let the back peck through as I have on this one. And lastly cheap tip #3. Inks. By buying most things in white you can then ink them to any colour you wish. On this page I have used two white flowers, left one white and inked the other black. Usually by inking or even colouring with markers yourself you get a great look and can completely customize it. Hope I have helped you save some money.